With much speculation as to whether the Denver Broncos would take a quarterback early in the draft to develop behind free agent pickup Case Keenum, Denver instead opted to bolster the defensive front with edge Bradley Chubb in Round 1 and two offensive skill players in WR Courtland Sutton from SMU and RB Royce Freeman on Day 2. Freeman is likely to make an immediate impact as a rookie due to both his running and receiving skills and could prove to be one of the best values in a stacked running back prospect group. Boston College CB Isaac Yiadom closed out Denver’s Friday, and should be an immediate help on special teams. Denver’s best Day 3 selection was Iowa linebacker Josey Jewell in Round 4, as he has the instincts and aggressiveness to be an every-down starter at the NFL level. For even more information on who the Broncos drafted and possibly some undrafted free agent players who could make the team, grab a copy of our 2018 NFL Draft Guide with expanded profiles, scouting reports, PFF signature stats and extensive details on over 300 players you cannot find anywhere else. 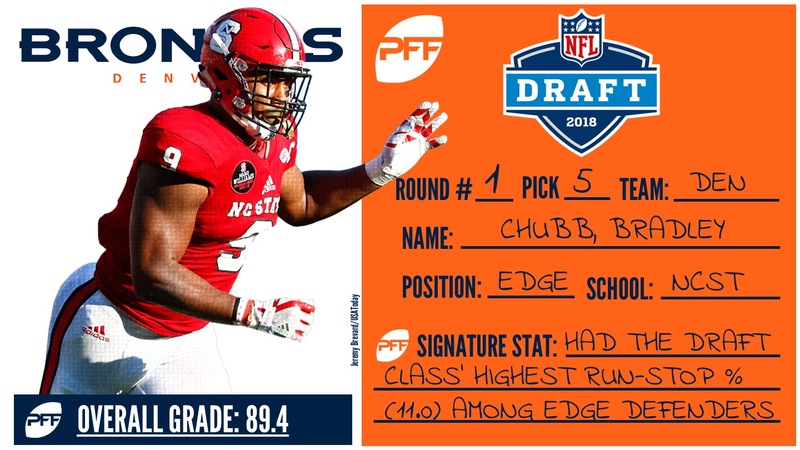 Chubb is an ideal power edge for Denver’s defensive scheme and has the versatility to line up inside in pass-rush situations as well. While his first step is excellent, his limited flexibility caps his ability off the edge, but on inside rushes, his 19.8 snaps per pressures ranked eighth in FBS last year. Where he is at his best against the run, as his run-stop percentage of 11.0 last year ranked second among all edge prospects. While a strong case could have been made for drafting UCLA (now Arizona Cardinals) QB Josh Rosen, Chubb should be a significant upgrade to a unit thrashed by free agency attrition and draft pick disappointments.